Augmentin is a penicillin antibiotic that is usually used in the treatment of lower respiratory, middle ear, sinus, skin, and urinary tract infections. 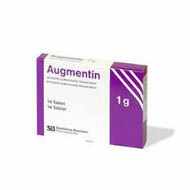 The usual dosage of Augmentin is once every 8 or 12 hours. But the dosage may vary according to the severe ness of the condition. You may take Augmentin with or without a meal. Ensure that you complete the full dosage schedule. Store it at room temperature away from the reach of children and avoid direct exposure to light and moisture. Some of the symptoms of an Augmentin overdose include Diarrhea, drowsiness, kidney problems, over activity and rash. Seek medical attention immediately if overdose is suspected. Augmentin is generally safe. However, people with anyone with liver, kidney, or blood disorders should maintain caution while taking the drug. If you have ever had an allergic reaction to another penicillin or to a cephalosporin, do not take Augmentin without first talking to your doctor. Before taking Augmentin, tell your doctor if you have kidney disease, or stomach or intestinal disease. Augmentin is in the FDA pregnancy category B. This means that it is not expected to be harmful to an unborn baby. Augmentin is generally considered to be safe for use during pregnancy. Do not, however, take Augmentin without first talking to your doctor if you are pregnant or could become pregnant during treatment. Augmentin passes into breast milk. Although serious problems have not been reported, rarely, Augmentin may cause a yeast infection, diarrhea, or an allergic reaction in a nursing infant, although no serious harm is expected. Do not take this medication without first talking to your doctor if you are breast-feeding a baby.